American author Kurt Vonnegut combined satiric social commentary and black comedy with surrealist and science fictional elements. His best known works are Player Piano (1952), Cat's Cradle (1963), Slaughterhouse-Five (1969; film, 1972), and Breakfast of Champions (1973). Known for his outspoken political opinions, Vonnegut also produced a host of essays, articles, and short stories. A number of his works have been translated into television or film, and he graced a few of these with cameo appearances. Vonnegut was also a graphic artist, and illustrated a number of his works himself. Common themes in Vonnegut's work include the dehumanization wrought by technology, as well as by bureaucracy and media indoctrination. Sexuality and violence and the myths that spring up around them are also common themes. While Vonnegut's work has sometimes been criticized for flouting accepted narrative conventions, for "sophomoric simplicity", and for vulgarity, there is no mistaking the passion of his underlying arguments -- for pacifism, for socialist equality, and most of all for the need for common decency. Yet what separates Vonnegut from other social commentators and political do-gooders is that he never seemed compelled to elevate himself above the rest of humanity. He portrayed himself, as he did nearly everyone else (hero or villain), as a dumb schmuck struggling to do his best, despite mispatched mental programming and an unsteady world. Kurt Vonnegut was born in 1922, on Armistice Day, in Indianapolis, IN. His father was a well-to-do architect whose fortunes, job opportunities, and mental health fell off drastically with the Great Depression. As a teenager, Vonnegut attended Shortridge High School, where he served as a writer and editor on the school paper, the Shortridge Daily Echo. After high school he enrolled in New York's Cornell University. 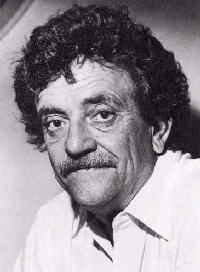 Although he lent his writing and editorial skills to the Cornell Sun, his major was biochemistry -- a choice made at the urging of his father, who believed that a degree in the hard sciences would better prepare his son for financial success than had his own background in architecture -- yet Vonnegut performed rather poorly in these studies and ended up leaving Cornell to join the U.S. Army in 1942. In the military he received training as a mechanical engineer, both at the Carnegie Institute and the University of Tennessee. He was then sent off to the European front lines where he served as an infantry battalion scout. On 14 December 1944, Vonnegut was captured by the Germans during the Battle of the Bulge. Vonnegut, a fourth generation German-American, was sent to a POW camp in Dresden. By day he worked in a liquid vitamin factory and by night he and his fellows were locked in the basement meat locker of a slaughterhouse. This lodging proved a blessing as the POWs safely rode out the Allied Forces' two day firebombing siege (13-15 February) of Dresden. While firestorms swept through other underground shelters, linked by various tunnels and openings, and suffocated or incinerated their occupants, the POWs remained unharmed. Meanwhile, the historic and breathtaking city was razed. Some 35,000-135,000 civilian residents, refugees, and wounded soldiers were annihilated. After the carnage Vonnegut was used by the Germans to help dig out corpses from the rubble. He later told his father, "Civilians cursed us and threw rocks as we carried bodies to huge funeral pyres in the city". But eventually the city was overrun by Soviet troops and Vonnegut was freed. He returned to the United States on 22 May and was awarded the Purple Heart. Much later, Vonnegut's World War II experience would form the core of his novel Slaughterhouse Five, published in 1969, during escalating opposition to the Vietnam War. Vonnegut's characterization of WWII, and all wars, as a "children's crusade", coupled with his sardonic depiction of the horrors of war, provided a potent antidote to patriotism and the Hollywood glamorization of battle. Yet horrifying as his WWII experience was, Vonnegut feels proud to have served, believing that it was an instance where intervention was the decent thing to do. When he returned to the U.S., Vonnegut married high school friend Jane Marie Cox. He spent the next couple years pursuing an M.A. in Anthropology at the University of Chicago. But his thesis, "Fluctuations Between Good & Evil in Simple Tales", was declined and the degree was not granted. Characteristically Vonnegut sidelined simultaneously as a news writer, working for the Chicago News Bureau as a police reporter. In 1947 he moved to Schenectady where he became a publicist for General Electric. The move came at the urging of older brother Bernard, a scientist at G.E. who had recently made some important discoveries on the effectiveness of silver iodide as ice-forming nuclei, marking the advent of effective cloud seeding technology. Fifty years later, after Bernard's passing, Vonnegut would pay tribute to his brother's discovery by scattering Bernard�s ashes over Mount Greylock, in the same area where the scientist had once tossed salt from a twin-prop plane to study the dynamics of precipitation. Vonnegut claimed that he enjoyed his time at G.E. immensely. But it was also an inspiration for him creatively, spurring a great deal of short fiction. In February 1950 his "Report on the Barnhouse Effect" appeared in Colliers. The work was well received, and within a year he was earning enough as an author to leave G.E. and move his family to Cape Cod. In 1951 Vonnegut published his first novel, Player Piano, which dealt with the notion that excessive replacement of human labor by technology would rob human beings of a sense of purpose. Interestingly, Vonnegut's suspicion of technology continued for the rest of his life; although he used a computer for word processing, he called the Internet "a particularly habit-forming, hallucinatory, pernicious form of LSD". Despite his initial success, Vonnegut was off and on forced to augment his earnings with various day jobs such as English teacher and ad man. He also started the first Saab dealership in the U.S. -- an enterprise that ended in bankruptcy. In 1957 his shut-in father passed away, and the following year, Vonnegut's sister died of cancer, two days after her husband had died in a train accident. The tragedy left the couple's four children orphaned. Vonnegut and his wife, who already had three kids of their own, adopted the eldest three children. (The fourth, an infant, went to live with another relative.) Eventually Vonnegut would adopt another child, Lilly, bringing the number of his brood to seven. All the while, Vonnegut's stature as a writer was growing. In addition to a plethora of short stories, he produced a string of solid novels, including The Sirens of Titan (1959), Cat's Cradle (1963), God Bless You, Mr. Rosewater (1965), and Slaughterhouse-Five (1969). In 1970, the same year he separated from his wife to move in with photographer Jill Krementz, he began teaching creative writing at Harvard University. A surprise bonus came in 1971, when Vonnegut belatedly received his M.A. in Anthropology from the University of Chicago: apparently the University decided to accept his novel Cat's Cradle in lieu of a formal thesis. The book, in which an absentminded scientist accidentally destroys the world by turning all water into ice, also deals with themes of rationalism and science versus the role of mysticism. Another downward turn came in 1972 however when Vonnegut's son, Mark, experienced a schizophrenic breakdown. But as it had been with the elder Vonnegut, tragedy and suffering provided Mark with literary inspiration; he produced The Eden Express: A Memoir of Insanity (1975). Mark, who realized that his condition may have been inherited from his grandmother, was also motivated to take up the study of medicine and of orthomolecular psychiatry at Harvard Medical School. Vonnegut's career, which had been on a slow but steady rise since the publication of Cat's Cradle seemed to peak with the movie release of Slaughterhouse-Five in 1972 and the subsequent publication of Breakfast of Champions in 1973. Although he had become a major name within the American literary scene and a darling to the counterculture, Breakfast of Champions was harshly panned by many critics, and Vonnegut himself seemed to be running out of steam. He claimed he was retiring. More novels eventually appeared -- Gal�pagos (1985), Bluebeard (1987), Hocus Pocus (1990) and Timequake (1997) were all bestsellers -- but Vonnegut claimed they were tedious to write, and critical reception was mixed. But even as Vonnegut's passion for writing slacked off, he found new joy in the doodles that decorated Slaughterhouse Five, Breakfast of Champions, and some of this other works. Running the gamut from assholes and penises to crude self-portraits, the doodles eventually emerged as an art form in their own right. Thus Vonnegut stopped scribbling at the edges of manuscripts and began drawing in earnest. His works now hang in galleries, and sell to the public as prints and T-shirt designs. In 1984, Vonnegut attempted suicide with pills and alcohol. In January of 2000 the top floor of his townhouse caught fire, and he had to be hospitalized for smoke inhalation. Although initially listed in critical condition, he was released after four days. Apparently, while Vonnegut was in bed watching the Super Bowl, an ashtray overturned, and he tried to extinguish the flames with a blanket. Ironically Vonnegut, who has smoked unfiltered Pall Mall cigarettes for decades, calls his smokes "a classy way to commit suicide" and expresses consternation that they haven't done their job yet. Although Vonnegut's output in novels slowed in his latter years, he continued to actively express his views in a variety of articles, essays, and columns. In his 2005 collection of essays, A Man Without A Country, he accused President George W. Bush of gathering "around him upper-crust C-students who know no history or geography". In a 10 May 2004 column for In These Times entitled "Cold Turkey", he referred to U.S. government leaders as "power-drunk chimpanzees". In another article he slyly pointed out that presidential candidates George W. Bush and John Kerry were "twins" -- "two Nordic, aristocratic multi-millionaires", both Yale men and both members of Skull and Bones Society. What's more, said Vonnegut, here they were running for president "at a time when entire vertebrate species" were in danger of "becoming, hey presto, nothing but skulls and bones". Although Vonnegut's acerbic wit and artistic nonconformity was decried by those preferring more genteel literature and greater political correctness, he was widely acknowledged by fans for his unique voice and for his commitment to abandoning social convention in favor of common human decency. His honors include the presidency of the American Humanist Association (since 1992, an honorary position formerly filled by science fiction author Isaac Asimov), an honorary doctorate of literature by Hobart and William Smith College, and being named State Author of New York (2001-03). He emerged as an icon of intellectual wit and well-meaning misanthropy, a kind of humanistic curmudgeon who could only properly be compared, in tone and purpose, to another great American satirist, Mark Twain. "I am an atheist (or at best a Unitarian who winds up in church quite a lot)." Kurt Vonnegut, Fates Worse Than Death: An Autobiographical Collage of The 1980s (1991).